Lora Innes, creator of the comic The Dreamer, has launched a project with a worthy cause–collecting money to combat human trafficking–and has gathered a small army of webcomickers, under the banner of The Comic Creator’s Alliance, to support the effort, including yours truly. The project itself involves the creation of a massive collage illustration featuring women characters from all the participating artists. The illustration will be made available as a desktop wallpaper to those who donate money to the cause. The donation drive kicks off on January 11th, which is National Human Trafficking Awareness Day in the U.S. While still in the looming shadow of the approaching New Year, I blogged about an initiative launched by Lora Innes, of The Dreamer, to rally the forces of webcomicdom into a project to incite folks to donate to a worthy cause. The cause in question: The struggle to raise awareness, and help put an end to, human trafficking. 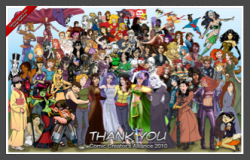 The project: A massive wallpaper illustration of nearly a hundred female characters from across the webcomicverse. As a side note of interest: I recently learned, courtesy of an NPR piece, that human trafficking is one (maybe the top?) of the Yakuza’s chief illicit money makers these days. I thought back to my time living in Japan. There was a section of the town where I lived (not a bustling metropolis, by any means) that looked like it could have been pulled straight out of a Webster’s dictionary entry for “red light district.” Even in my own apartment building, there was a floor known to be populated solely by low-level Yakuza (“chinpira”) and a bevvy of their Filipino bar “hostesses.” In retrospect, I wonder whether any–and how many–of the women in that neighborhood, and in my own apartment, we somehow forced to work in the “water trade.” Food for thought. CCA Donation Tally - Lora Innes posted the final tally for donations to the Comic Creator’s Alliance drive to fight human trafficking, and the remarkable number was over $10,000! All from webcomic readers. How cool! Thanks to everyone from this neck of the woods who linked over and donated. Instances - The “Instances” gallery show at the Colacino Gallery at Nazareth College wraps up today with a closing reception tonight (Fri. 2/5) from 6-8pm. If you’re in the neighborhood, please come! Here’s a link to gallery info. TWCL Awards - I’ve created an extra-long comic that serves as part of the “awards ceremony” for the 2009 Webcomic List Awards. My strip serves to present the award for Best Comic, and although I’m sorry to say OP wasn’t nominated for any awards itself, just getting to create the presentation comic for what I presume will be the most prominent part of the “show” is gratifying. Thanks to Wendy at TWCL for letting me pitch in. The awards ceremony goes live on Sun., 2/7, at (I suspect) this address: thewebcomiclist.com/awards and I’ll repost my own contribution here on Monday, so you can see it at full size. 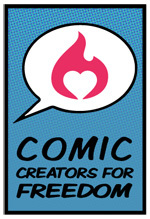 I have been excessively remiss in telling you all about this year’s Comic Creators Alliance donation drive to fight human trafficking. As she did the year before, Lora Innes (of The Dreamer) pulled together a huge group of comic creators–including notables like comic veteran Adam Hughes, Billy Tucci of Shi, Barb Jacobs of Xylia Tales, and Chris Watkins of Odori Park (see what I did there? )–to compile a big fun wallpaper featuring all their characters. This year, the wallpaper is also available as a print. The donation drive went live on the 11th, but I’ve been so immeasurably swamped that I neglected to help get the word out. The drive runs until January 24th, though, so I think I have a chance to redeem myself. “What is Human Trafficking? Human Trafficking is a sanitized term for slavery. There are over 27 million people enslaved in the world today, and most if it is young girls being sold into forced prostitution–both over seas and yes, in the United States. In the United States there are only 39 beds at facilities for victims in the entire nation–and at least 16,000 people being trafficked into the US from other countries each year! Not to count the domestic victims already living here.